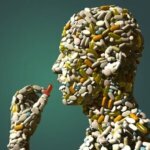 If you are taking prescription drugs you may experience reactions with some of the supplements. Why? Example: If you are taking a pain medication don’t take cayenne pepper----- or I should say “stop taking the drug because cayenne pepper is a natural strong anti-inflammatory. Taking your drug and cayenne pepper could cause adverse reactions. With the help of your Doctor or Health-care Practitioner eliminate as many prescription and nonprescription drugs you are taking before starting “My 60-Day Planner.” Tell your doctor about all the prescription, over-the-counter medications, and supplements you use. This includes vitamins, minerals, herbal products, and drugs prescribed by other doctors. Keep a list with you of all the medicines you use and show this list to your Doctor. Ask your Doctor, which drugs you, can eliminate immediately and which ones he can help you slowly reduce. Your Prescription for Toxic Overload! Why would I write a special section on prescription drugs? 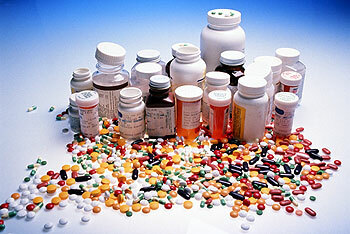 Prescription and nonprescription drugs are probably one of the most toxic things you can put into your body. Why? Drugs are loaded with toxic chemicals. All drugs have negative side effects. Read the insert on the drugs you are taking and go to the list of side effects. Do you really know what you are taking and why? Your Doctor has been educated on how to write prescriptions for every condition that you’re experiencing. Is this a good thing? In most cases no. Why? I don’t believe in treating symptoms. I believe in treating the whole body by finding the cause first instead of treating symptoms. You have a Migraine headache. Your Doctor will give you a prescription painkiller to trick the brain to stop sending pain signals. What is causing your Migraine? That is the question that should be answered before any medication is prescribed. In most cases drinking one-quart of Alkaline Water every 30 minutes will stop the Migraine. Is dehydration the problem? I would rather drink the Water first to see if I am dehydrated before taking painkillers. You must start taking personal responsibility and get off as many prescription drugs as you can to reduce your toxic load going into your body. You’re never going to get well again taking prescription and nonprescription drugs. Are not the answer to bring you back to health. Nobel Prize winning chemist Linus Pauling predicted that the use of toxic chemicals to suppress disease symptoms, which he called a toximolecular approach, was a blind alley that would lead nowhere. Where it has lead is to a catastrophically expensive and ineffective disease-care system, where people are killed and injured daily, and where they remain chronically ill. When someone is sick, they are already in toxic overload. Why compound their problems by giving them more toxins? Pauling proposed an orthomolecular approach where one provides molecules that are natural and helpful in supporting and restoring normal cell functions, allowing the body to heal and restore itself to health. If you are now on prescription drugs, recognize that you are choosing to take them, and that there are safer, more natural, and more effective alternatives. You may want to find yourself another doctor, one practicing orthomolecular or preventive medicine, which will address the causes of your problem and help you get well, rather than prescribing poison to suppress your symptoms. To make a sick person well, you have give their cells all the things they need to function normally, and keep them away from the things that disrupt normal function. Prescription drugs disrupt normal cell function. When cell function is normalized, you cannot be sick. This is what the orthomolecular approach is all about. It's using vitamins, minerals, phytochemicals, and natural remedies to rebalance the body and make it well again. The obsolete approach of using toxic prescription drugs to suppress symptoms is guaranteed to make and keep people sick. Raymond Francis is an M.I.T.-trained scientist says, “Prescription drugs are one of America’s leading causes of disease and death. The problem with prescription drugs is very simple…they do nothing to cure disease. All they do is suppress the symptoms of disease by disrupting normal cellular functions. Abnormal cell function is the very definition of disease, and since prescription drugs cause our cells to malfunction, then… yes, drugs cause disease, but we obscure this fact by calling these diseases "side effects." Ironically, the "side effects" are often more dangerous than the disease being treated in the first place. A recent study in the Journal of the American Medical Association (JAMA) found that in one year over two million hospitalized patients suffered serious drug reactions, resulting in 106,000 deaths. Some side effects! But this is only the tip of the iceberg. Too many adverse reactions cause public concern and scrutiny, so just imagine a hospital’s incentive to understate them. Another article in JAMA estimated that only 1 in 20 reactions are reported. Here is the dilemma we are confronted with; the more prescription drugs you are taking the more toxins you are accumulating in your body. These toxins are causing the disruption of normal cell functions in your body. If you don’t stop taking the prescription drugs nothing in “My 60-Day Planner” is going to do much good. You may get better but as soon as you stop the therapeutic nutritional supplements and “Anti-Cancer Diet” your body will begin to fall back into the disease state if you are taking prescription drugs. Your goal is to reduce by 90% the toxins going into your body. This will be fairly easy to do while you are on “My 60-Day Planner” because you will concentrate most of your eating on organic vegetables, clean Alkaline Water, and grass fed meats. If you follow the Planner and purchased your non-toxic soaps, shampoos, skin-care products, air purifier and eliminate the use of prescription drugs, your chances of winning this battle increase tremendously. What happens when your Doctor is uncooperative in reducing your prescription use? This will happen frequently because your Doctor was the one that prescribed the medication, why would he admit that you don’t need the drugs anymore. When this happens you will need a second opinion from someone who specializes in no drug intervention. Who is this? Call a “Health-care Practitioner” in your area that will work with you in reducing or eliminating all the prescription and nonprescription drug use. How do I find a “Health-care Practitioner" In my Area? That is “You” – Take personal responsibility for your disease. Start educating yourself on your disease and take charge of your Life! Do your research and take charge of your health. By reading my book you have educated yourself by understanding why you are sick and what you need to do to get healthy again. Prescription and nonprescription drugs are causing “cellular chaos” and you need to safely stop taking them. Now go and take charge! Use my E-Mail or Cell Phone service to ask any questions you may have related to your prescription drugs you are taking. While I am not a Doctor, I can guide you through the maze of disinformation you may encounter.